The 13th District police commander, Judith G. Martin, distributed this safety alert on Feb. 11. Seven crimes that fit this description later were reported online this month on the everyblock.com website. 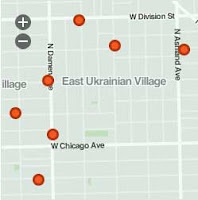 There have been recent robberies reported in the area of the Division to Augusta/Wood to Leavitt. Various days of the week, various times of the day. General description: Male black, 30 to 45 years of age, 6'00" to 6'04", 200-230 lbs, brown eyes, dark hair, light to medium complexion. The offender approaches a victim, displays a handgun and demands proceeds from the victim. The offender then tells victim to walk in the opposite direction. The offender has been described as having a calm demeanor during the robbery. Call 911 when you see anyone fitting this description or anyone you feel is suspicious. Do not confront the individual. Should a robbery occur, take no action which would jeopardize your personal safety. If you feel you are being followed look for a store or a large crowd to go to and call the police. Cross the street if possible. Never fight or resist the offender when the money or items are demanded. Items can be replaced but you cannot! I live near the corner of Hoyne and Augusta. A sign went up in my building about a mugging that happened at Hoyne and Iowa probably the second week of Feb. The note says her friend was walking to Dominick's on Chicago and got beat pretty bad. No description was left. Also, on Super Bowl Sunday I was coming home from the grocery store and there were about a dozen Latino kids age 10-15 in the mail area and going through the halls of our building. I caught them stealing mail and told them to get out of the building. They left but one of them chucked a piece of ice at me and several were wearing ski masks. It was pretty unsettling. I called the police and left an anonymous report. Keep your eyes open out there. i just got my house broken in to on winchester, just north of agusta. i was walking to work and i saw this exact description of the person above. he gave me a very strange look and i just got a bad feeling about him. after reading this, i would almost bet it was him.